Here is the unique knowledge that will help you through the 3 minutes with Loreen and “Statements” in Melodifestivalen 2017. Follow the message of the lyrics, the pre-recorded segment with the child – and understand the advanced dance with lots of historical references. Sweden’s Eurovision winner from 2012 is back – but not with any new Euphoria, according Loreen herself. Here’s how to understand Statements, the artist’s comeback contribution in the contest – super guide step by step. The lyrics of the song “Statements” is written by Loreen and Linnea Deb, who is the songwriter of the contribution together with Joy Deb and Anton Hård av Segerstad. Loreen opens her return in the Melodifestivalen with a read taken from the Berber, spoken by the indigenous people in North Africa. The artist explains that it comes from her own roots around the Atlas Mountains. 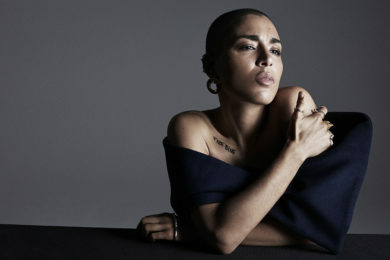 – It is a cry, scream coming from the tribe (tribe), I’m Berber from the Atlas Mountains as well, says Loreen. – It was actually Loreen who said, “Read between the lies …”. I thought that was smart. That you have your karma, and you are talking to the karma. – What I think is that she means, I’ll put an end to the sadness, sorrow or plague, so let me be awhile. Do you understand? It is very suggestive. There is a lightning there? Not that one should imagine the end of the world? – No, not at all. Without the end of something boring and the beginning of something new. Then she believes that, then you and I do not need to talk anything anymore, because we’ve solved it, “says Linnea Deb. – We may not need to hear what you think we should do, I think so, says Linnea Deb. – It might be … it is up to the interpreter, haha. I understand that we do not need simple and ready-made answers? Loreen says that the line is about taking power back to itself. – “Words cut but I do not care how much it hurts”, that’s positive. “Shades for the blind. I can not hear your empty words”, we do not need blank words. We do not need no statements, like. 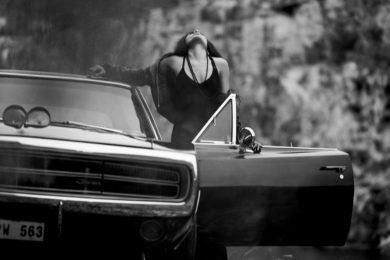 It’s really taking back the power to itself”, says Loreen. – That word hurts, but I’m in it. We have shadows and shades of everything, but it will still not change anything because I do not intend to listen to these empty words. We do not need any statements. But it can be interpreted in very many ways, says Linnea Deb. – What we mean is that we do not need nice statements like “make love”. We need to do something, says Linnea Deb. – I think that there are so many who post articles on Facebook and sits and beats his breast. I sometimes get the feeling that people put up these things more for its own sake. To, “look at me, I am very political, I have opinions”. But it does not change anything. In that case, if it will be a good debate, I usually do not think it will be. It will be rather bouncing or fjording. Therefore, we have “we do not need no statements”. – It’s my favorite verse! I am pleased with myself, says Linnea Deb. Pray less, change the world, as he sang in the song Cry. – Then she believes that Virgin Mary says, “No, you are building up before war here, why are you doing that?”, says Linnea Deb. – We have done our best, but you do not think so. It is Mary who says “otherwise”? A rejection of the past far too little effort or anything like that? – It’s so hard to explain because it can be meaningful to me, but it can be difficult to explain in simple words exactly what that means. There is a flow … I love the lyrics, but I can not always explain exactly what I mean. But I think it’s great that we made it so open to interpretation, says Linnea Deb. – It means “We need to do something”. Why in Arabic? 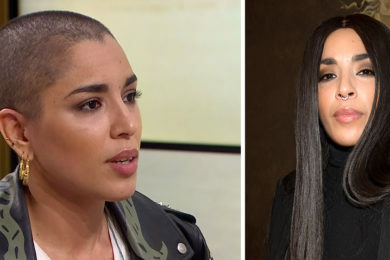 Well, that’s Berber, it’s my roots”, says Loreen. Loreen want to empower people in a troubled time. It’s Eurovision winner’s main message in Melodifestivalen 2017 comeback Statements. – I think it is up to date now. I do not think it’s just me who is going through a fear of where we are going in the world today. I think it’s something everyone knows. I see it, that’s what is written in the newspapers … It’s superactual. And I think, instead of stopping the head in the sand and pretending to be raining, we look forward to watching our fears, taking power from it and trying to solve our issues. So that we can be happy in depth. – Yes I can. I’m standing here. But it takes a bit of my power. It takes a bit of my ego and my fears to stand here. Certainly go out on the couch … But I still do something. There are many who do what we are going to pick up. I really want to press that. – I want to say that none of us is a victim of anything. For society, too small problems or too big problems, it does not matter. With that, we take back the power to each individual. If I’m not a victim, it means that I can change my situation, which means that I control my own happiness. – I have the power to do it, nobody else does. If I start there, things will happen quite quickly to change around me. The prejudices disappear. I take back the power and power of the individual and the people. I do not like cracks, infecting division and the feeling that we can not trust anyone, says Loreen. Loreen is back with an advanced dance choreography in Melodifestivalen 2017. The artist shows herself by cloning herself in the dancers – and portrays including netthat, the French Revolution and the iconic image of the woman with the handbag who resisted the Nazi demonstration in the 1980s. – It is a way of portraying different phases in Loreen’s or a woman’s life, her development and approach, says director Martin Renck to SVT. Loreen’s comeback begins with a pre-recorded sequence. – It is a sequence of a girl who is eleven, but represents seven and begins the entire number. There we start to pick up Loreen with a small double exposure. So, she comes in and sings over the little child. Then you start to realize that, aha, that’s Loreen as young, and as full grown, says Renck. 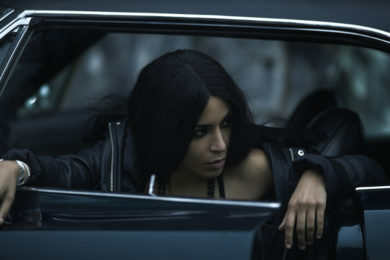 At the beginning of the song, a single camera Loreen follows the scene. – It seems as if it happens on stage. Then comes Loreen in and because everyone is in grayscale, and light is white it does not feel like a flashback. Everything is based on a fixed camera that goes in one direction only. When Loreen walks forward, one sees a girl sitting on the floor. Then you first believe that it is the same girl who appeared in the pre-recording, but suddenly she has aged ten years, says Renck. 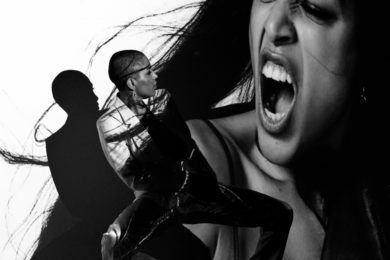 The young dancer sitting to the right of Loreen on the stage rises up and looks screaming. Renck says that the sequence is based on the lyrics – and can be interpreted as a comment on internet hate in today’s society. – She is dressed so that she cried, because then she represents someone who acts as the text on someone who has been hated online. A little unhappy, and cracked the 13-year-old. First time heart broken roughly, says Martin Renck. Then three more female dancers of varied ages enter the stage. – All girls who come in represent Loreen and her different aspects. How to be like a woman It can be a rebel, a victim, a wise lady or a wise old lady who can make you get up and get to see yourself in a different way. Or to find her inner strength, hope in life and support in her own femininity and person”, says Renck. Loreen and two of the dancers waving dramatically each with a large flag. – In part, the flags are a pure show-effect because it is nice. But they will get flags that go in tune with the clothes. Loreen is in the white direction. She represents some kind of queen / princess / jesus / the alluring … as well as perfected. The others have gray flags. They should be like an extension of their characters, says Martin Renck. They first form the classic artwork Freedom of the barricades during the French Revolution. – It is a pose that says they like doing revolt against the aristocracy and powers. Then the people come from below and take place. It is the first stage, says Renck. – “Euphoria”-Loreen has become Jeanne d’Arc. She was a woman who fought for the right causes, comments Loreen. Then the woman suddenly appeared with the handbag, who said no to a Nazi demonstration in Sweden in the 80’s, on the stage – and knocks it in the air against Loreen and the dancers. – It is a dramatized version that will somehow give hints about a classic sequence with the lady in Vaxjo. The whole thing is that it questions some roles, to the question put some facades. Everything is a pantomime that morphs to different roles, one can be such on one side, and so on the other hand. It is a way of recognizing that humans are pretty complex, but also to tell who are the ones who hate each other? Can you hate a hater, kill them with love or how do you do? It is not that we have outlined roles as we imagine in this issue, without anyone being represented one side and the other another and then we do a small chamber drama about the stuff in this song. No messer than that, says Martin Renck. Loreen has a white flag, the dancers have flags in gray tones. – Loreen’s flag is white, it is the peace flag. Black Flag is the plague flag, so it is clear that they have some symbolic quality too. The second flagship is inspired by Danuta Danielsson – the Polish woman, on April 13, 1985, showed resistance with her handbag at a Nazi demonstration in Växjö. – The second moment is a paraphrase on the Nazi march when the woman, Danuta, comes and hits them in head with her handbag. – It represents Loreen and that she can look at herself through other ideas or representations of how people spontaneously have reacted to things that happened in front of them. It’s a way to show how to react how to face such a thing completely unplanned. Then they throw the flags and enter another role, says Renck. – There we have a woman who got involved. It was a Nazi train and she acted. She said no. It is such a strong historical reminder of people’s commitment, she is an activist and we must dare to take a stand. We have to do it today. Take a stand for ourselves. I usually say that it starts with yourself. Happy people never go to war (lucky people do not start any war). Start by strengthening yourself. I chose that picture because she made a statement.